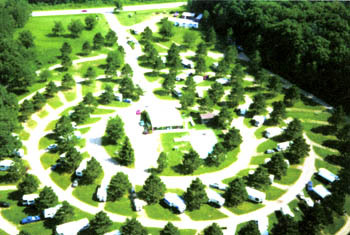 Conveniently located in Lake Delton, close to all the Wisconsin Dells attractions, Country Roads Motorhome & RV Park is truly one of finest RV parks and RV campgrounds you'll find in Wisconsin! 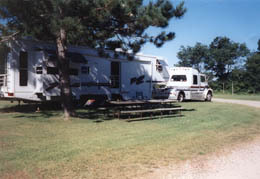 Our grassy campsites are spacious, ideal for big rigs and large RV's, and feature large trees and pull-through access. From our friendly and helpful staff, to our beautiful setting and clean and quiet facilities, you'll enjoy a relaxing vacation or weekend getaway at the Country Roads Motorhome & RV Park. Long-term seasonal sites are available! 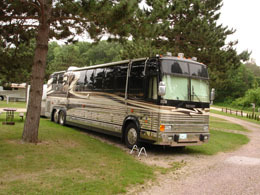 For the Older Kids Motorhome & RV Park! Country Roads has been named as a "best bet" in the Big Rigs Directory! Be sure to visit us soon! Sorry no tent camping available. Directions: We are located off Hwy 90/94, Exit 89. 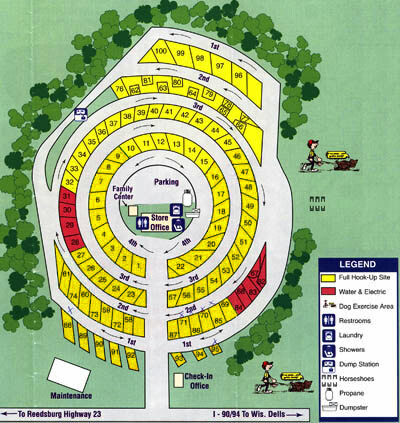 Go southwest on Hwy 23 for 1/4 mile, and our motorhome and RV park will be on the right.